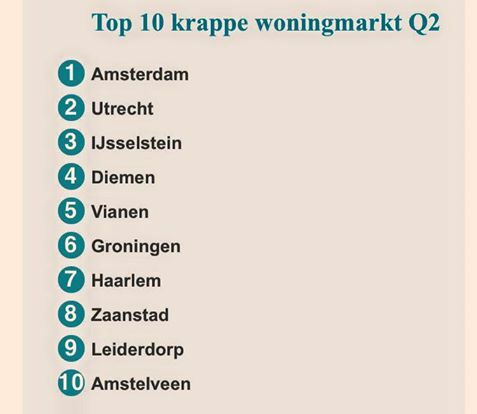 Een lijst uit het Financieel Dagblad, waar de woningmarkt (te) krap is en de beschikbare woningen te duur zijn. IJsselstein op de 3e plaats. It is actually a great and useful piece of information. I’m happy that you simply shared this helpful information with us. Please keep us up to date like this. Thank you for sharing. F*ckin’ remarkable things here. I’m very glad to look your article. Thank you so much and i’m having a look ahead to contact you. Will you please drop me a e-mail? My partner and I absolutely love your blog and find almost all of your post’s to be exactly I’m looking for. Would you offer guest writers to write content in your case? I wouldn’t mind publishing a post or elaborating on most of the subjects you write with regards to here. Again, awesome site! Hi, Neat post. There’s a problem together with your web site in web explorer, would check this… IE still is the market chief and a big element of folks will leave out your great writing due to this problem. hey there and thank you to your information – I have definitely picked up anything new from proper here. I did then again experience some technical issues the use of this website, as I skilled to reload the website lots of occasions previous to I could get it to load correctly. I had been thinking about if your hosting is OK? No longer that I am complaining, however slow loading cases times will sometimes affect your placement in google and could harm your quality ranking if advertising and ***********|advertising|advertising|advertising and *********** with Adwords. Anyway I’m adding this RSS to my email and could look out for a lot more of your respective intriguing content. Make sure you replace this once more very soon.. Valuable information. Lucky me I discovered your website unintentionally, and I’m shocked why this accident did not took place in advance! I bookmarked it. Woah! I’m really loving the template/theme of this blog. It’s simple, yet effective. A lot of times it’s difficult to get that “perfect balance” between user friendliness and visual appearance. I must say that you’ve done a great job with this. Additionally, the blog loads very quick for me on Safari. Superb Blog! Thanks for another fantastic post. Where else could anybody get that kind of info in such an ideal way of writing? I have a presentation next week, and I’m on the look for such info. Hi my friend! I wish to say that this post is awesome, great written and include almost all significant infos. I’d like to peer more posts like this . Pretty great post. I simply stumbled upon your blog and wanted to mention that I’ve really loved surfing around your weblog posts. After all I will be subscribing on your feed and I’m hoping you write again soon! Useful information. Lucky me I discovered your website unintentionally, and I am surprised why this coincidence didn’t happened in advance! I bookmarked it. Hi there would you mind sharing which blog platform you’re working with? I’m going to start my own blog soon but I’m having a hard time selecting between BlogEngine/Wordpress/B2evolution and Drupal. The reason I ask is because your design seems different then most blogs and I’m looking for something unique. P.S Sorry for getting off-topic but I had to ask! I am curious to find out what blog system you’re utilizing? I’m having some minor security problems with my latest blog and I would like to find something more safe. Do you have any recommendations? This site is really a walk-through for all of the information you wanted about it and didnÃ¢â‚¬â„¢t know who to question. Glimpse here, and youÃ¢â‚¬â„¢ll certainly discover it. hey there and thank you for your info – I have certainly picked up something new from right here. I did however expertise some technical points using this web site, as I experienced to reload the website many times previous to I could get it to load properly. I had been wondering if your web host is OK? Not that I’m complaining, but sluggish loading instances times will very frequently affect your placement in google and could damage your high-quality score if ads and marketing with Adwords. Well I’m adding this RSS to my e-mail and can look out for much more of your respective intriguing content. Ensure that you update this again soon..
Hi there! I could have sworn I’ve been to this website before but after reading through some of the post I realized it’s new to me. Anyhow, I’m definitely delighted I found it and I’ll be bookmarking and checking back often! I am now not positive the place you are getting your info, but good topic. I must spend a while studying much more or working out more. Thanks for great information I used to be looking for this information for my mission. You’re so awesome! I don’t believe I have read a single thing like that before. So nice to find someone with genuine thoughts on this issue. Seriously.. thanks for starting this up. This web site is something that is needed on the web, someone with some originality!